Have you heard about powerline ethernet adapter ? Ha! This is simple and useful adapter that you can use to extend home network by making use of home’s powerlines and connect to other computers or network devices. Convenient - This adapter is convenient to be used if you want to reduce the usage of network cables and make use of powerlines to extend network. Plug and Play - Plug in powerline adapter and other network devices and it will work. Fast & Secure – 85 Mbps, 200 Mbps or higher transmission speed over powerline network. Secure - Data transmission over powerlines is secured with 128bits AES, 56bits DES or other encryptions. Easy to Expand Network - Can add new powerline adapter to expand network, but must be compatible with existing powerline adapters. Let’s explore on how to use it. It’s easy to use as it is plug & play. You need to have at least a pair of this adapter in order to make it works. 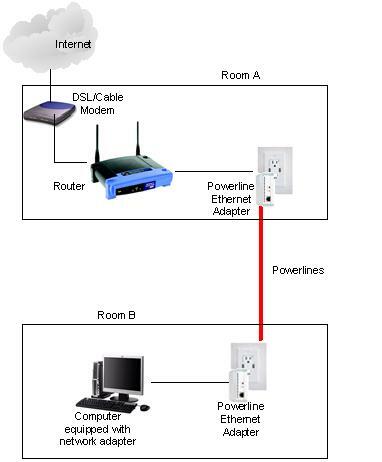 As you can see example below, I use a pair of powerline adapter to share Internet via wireless router in room A with a computer in room B. You just need to plug the powerline adapter into power outlet in room A, and then use a network cable to connect router’s LAN port to powerline adapter’s network port. After that walk to room B, plug the powerline adapter into power outlet and also use a network cable to connect computer’s network card to powerline adapter’s network port. That’s it! Both devices should now be able to talk to each other after waiting for some times, the effect is same as you connect computer and router with network cable directly. Please note the data transmission over powerlines is secured with default encryption key, and so you are advised to change it as according to product manual. You should also install powerline utility in order to manage the adapters better. If you are interested, have a look on these powerline ethernet adapters . Note: Some of the powerline adapter might comes with 4 or more network ports, so you can connect more network devices to single adapter. Return to top of "Powerline Ethernet Adapter – Simple Way to Extend Home Network"! !